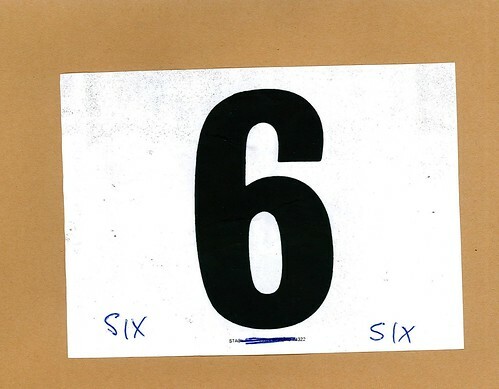 I turned up early enough to register Isobel too — she’d compete in the first event of the day, the U13 girls, and I’d run the final event, the senior mens — and collected race number 6, not to be confused with 9. We were at the Swansea University playing fields, Fairwood, for the second race in the West Glamorgan cross country league, incorporating the West Wales championships. It was sunny and fresh. Recent rainfall had soaked the ground. Perfect cross country conditions. Gail, Alex and my parents arrived in time to see Isobel start, but only just: they’d been watching Alex play rugby at Penclawdd, where the referee had extended the game because the home team were about to score a try. The girls were strung along the far side of the field, the front runners striding out. Pembrokeshire Harriers had the first two places. We intercepted the route to cheer Isobel along the first and second fields — the up and down bit of the course — then climbed the bank to the finish line, by the observatory. She did well. An hour to go before the men’s race. My family found a place to sit and Gail sorted them out with hot drinks and snacks. I got myself ready. I knew a few people from the Saturday morning runs: Ifan, the animal beast monster; Ross, the race-winning triathlete, who’d competed in another event yesterday and been training on the bike this morning; Raul, who couldn’t believe I wouldn’t be doing the Gower coastal half marathon next weekend; and Simon who asked if I was running, and then said, shame, he wouldn’t win. I laced my shoes tightly and double-knotted them: at Bridgend I’d almost left one stuck in the mud. I recognised a few more athletes from Bridgend and Brecon. Many have the look — skinny, long-limbed, elastic — but by no means all, and, even at the age of 47, I’m far from being the oldest: these guys never give up. The tail-enders in the women’s race were finishing. Not long now. I jogged across the pitch and back, keeping warm. Go! Some people complain about running laps rather than a single extended circuit, but, as someone new to the course, it suits me. I gave it more than at Bridgend, striding out on the downhills, digging in on the climbs. Ross came alongside me on the second lap. He runs so smoothly. Go on, Thomas! That was Gail. Mrs Smith, Isobel’s ironman science teacher, had finished the women’s race in time to take up a position on the second field and encourage everyone. Appreciated. I picked up my pace on the final lap. Amazingly, Ross fell back. I’d dropped him. One last push to the finish. 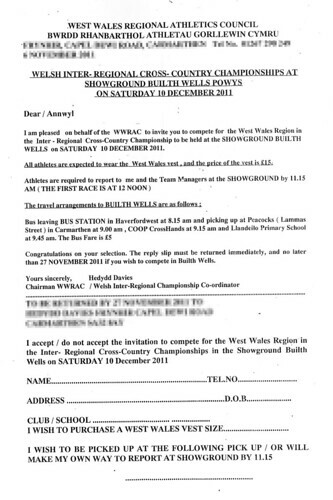 Dr Hedydd Davies handed me a letter as I crossed the line: an invitation to run for West Wales in the inter-regional championships in Builth Wells! I’m accepting, of course, but have two questions: what size vest? and should I get spikes? My thanks to Chris Fulcher for allowing me to use his wonderful photos. More of his photos of the event can be found here.